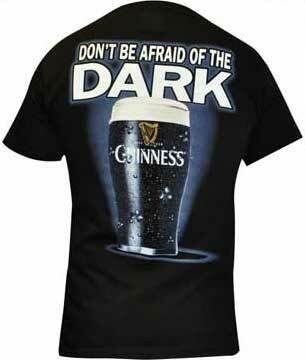 The Don't be Afraid of the Dark, short sleeve, black Guinness t-shirt features a large pint of the black stuff. This double sided, 100% pre-shrunk cotton, Irish t-shirt also has the Guinness harp logo on the front left chest. The Guinness t-shirt will be well received at your local pub and it may become your favorite shirt.